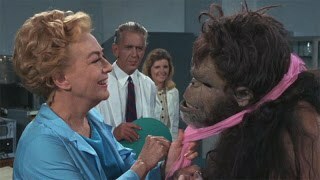 Redeeming Joan Crawford's Final Film "Trog!" Like the works of Edgar Allan Poe or Vincent Van Gogh, a movie is sometimes unfairly labeled as "bad," and shunted aside for the next week's new release. It gets filed away as a dud and for every Faster, Pussycat!, there are dozens of rhinestones-in-the-rough which are forgotten about. It is my hope to dust off these cinematic crapfests and try to salvage them in my own fledgling series I've so cleverly named "Redemption". 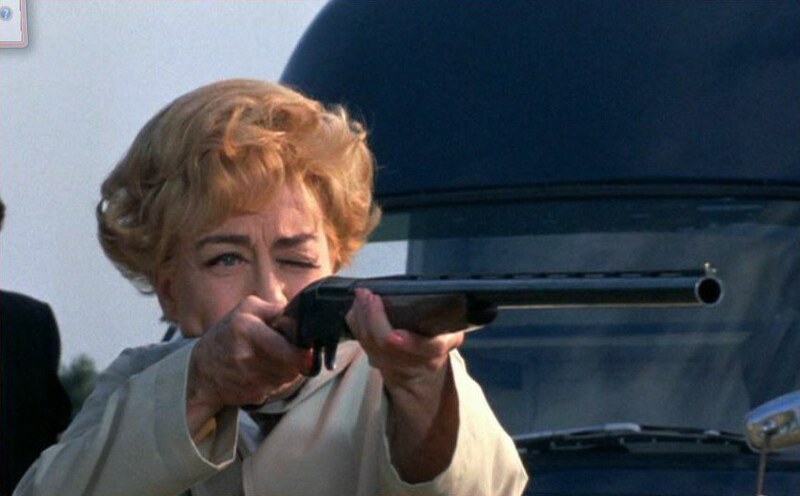 This week's offender is the 1970 "horror" "classic" Trog!, Hollywood icon Joan Crawford's final feature film. I would like to point out that in reviewing movies such as these I (mercifully) do not grade them along the same sliding scale reserved for movies of substance and merit. Instead, I sift through the hackneyed writing and overwrought facial expressions in search of at least one redeeming factor. Though an ignominious end to a stellar career, I am sure that Crawford's star power (however dimmed by 1970) will be enough to buoy the movie. Having fallen just a few years short of the rise of the fast-paced summer thriller, Trog! inches by at a relentlessly slow pace and is propelled along by clichés. The "uncharted territory" trope rears it's ugly head not long into the film, ("We could be the first humans down here!" "Yeah! Let's look around!") and it becomes painfully clear that this movie will have all of the suspense and aesthetic appeal of a 90 minute long episode of the original Scooby-Doo. Being a horror film of a different age, the suspense surrounding the titular Trog (the missing link) is ruined by encroaching shadows and an unintentionally funny attack on an explorer. Had the Hitchcock style of unseen violence been used, it might have had more of an effect on the viewer, but ten minutes in and without the screen presence of Joan Crawford it becomes impossible to regard this as anything but supremely corny and contrived. The fact that this movie lies chronologically between such horror movies of note as Rosemary's Baby (1968) and The Exorcist (1973) makes this style of unintentionally comedic horror inexcusable. Crawford has yet to be seen and already the aged actress is tasked with the herculean effort of lifting this trainwreck to at best a B-movie. The grand dame appears onscreen not with a bang but with a smouldering whimper, playing to her costars with a forced, wide-eyed innocence reminiscent of her decades-earlier romance movies. While Crawford's restraint served as a grim, effective counterpoint to Bette Davis' all-out madness in Whatever Happened to Baby Jane?, she now seems hopelessly out of place amid the frenetic chaos, akin to Julie Andrews touring with Metallica. 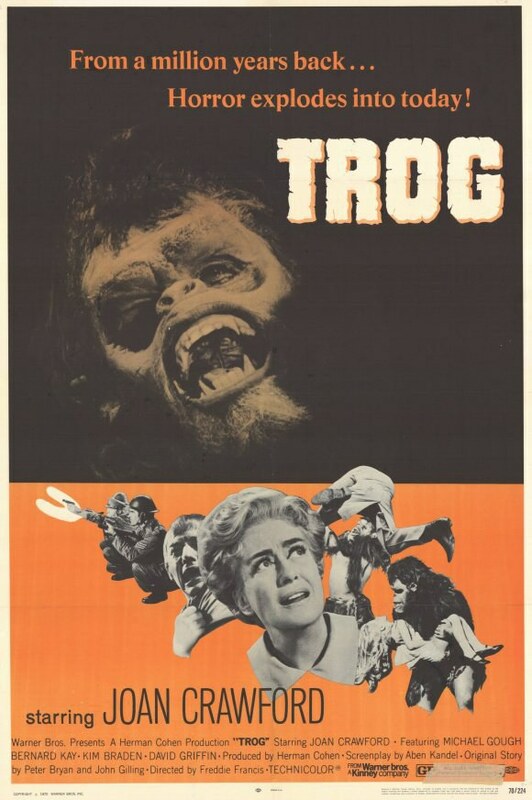 Once Trog is captured, the movie more or less collapses in on itself in a far-less-than spectacular heap of contrived plot advancement and pseudoscientific babbling. The pizza I ordered got delivered so my attention dropped off, though I could tell I wasn't exactly missing Citizen Kane. Final Verdict: Trog! is laughably light on scares, brains, and heart, and, with all due respect, it's fitting that this is Crawford's last feature film. The only joy to be derived from this is the overwhelming camp value, with the Academy Award-winning film icon screaming disjointed bits of dialogue at a man in a deformed monkey mask. Because it almost seems that this film was created to be subversive of horror films of quality and taste, because it's just so unrepentantly awful that it must be seen to be believed, Redemption Approved.